Magicians utilize slight of hand, distraction, and simple laws of illusion when they perform. The earliest traces of magical practice are found in the European caves of the middle Palaeolithic Age. 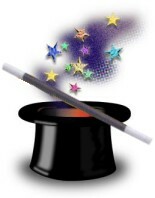 The honor of the first "Magician" is usually bestowed upon a character dating back to the Westcar Papyrus (1700 B.C.) by the name of Dedi. He was noted for decapitating fowl and restoring them to perfect health. Some of the first practitioners of Magic used it to sway the religious beliefs of people. The high priests of Greece rigged temple doors to open and fires to light without any apparent human intervention. The theatrical aspects of Magic began to be formalized through the performances of a Frenchman by the name of Jean Eug�ne Robert-Houdin around the 1840's. Called by many as the "Father of Modern Magic", Robert-Houdin enthralled the people of his era with many mechanical wonders he invented. It was from this man that Harry Houdini, one of the 10 most recognized names to this day, took his stage name. Things really started happening in the early 1900's with the emergence of Vaudeville. This launched that little known magician named Houdini and Blackstone, Thurston, and P.T. Selbit whose claim to fame was "sawing a woman in half". Admiral Tom Thumb was a midget magician who worked for Ringling Brothers circus selling his own magic sets complete with tiny cards. Pulling a rabbit from a hat is a classic symbol of magic yet in truth has rarely been a part of any magician's show. By some accounts, the idea of pulling a rabbit from a hat was part of a publicity stunt. Created by a British magician, the effect capitalized on the public's interest in a woman who claimed to have given birth to a litter of rabbits. Ultimately, magic is the only theatrical art which needs to be seen live in order to truly appreciate it. Fortunately for buskers, this close-up impact makes all the difference.